The social contract put forth by Thomas Hobbes, Locke, Rousseau, et al; stated that in a political vacuum life would be “nasty, brutish and short.” Without political authority access to all things is unabated, natural freedoms are unlimited and the individual is self-possessed to protect his or her own freedom and self-preservation. This vacuum would give rise to an anarchic, consumptive society; Hobbes, “war of all against all.” This is avoided through the subjugation of the self to a higher authority, community or civil society. Civil rights arise from political authority. There is an obligation to respect and defend the rights of others in this Social Contract. Within defined nation-states the terms of this contract, while abstract, are identifiable: there is a contract, the parties are identified, agreements are made in a reasoned manner. We have identified a terrain vague, an undefined continent outside political spheres, outside the social contract. The expanse of the ocean, just offshore, nasty, brutish and uncivilized is hanging in the balance of land based decisions and neglect. 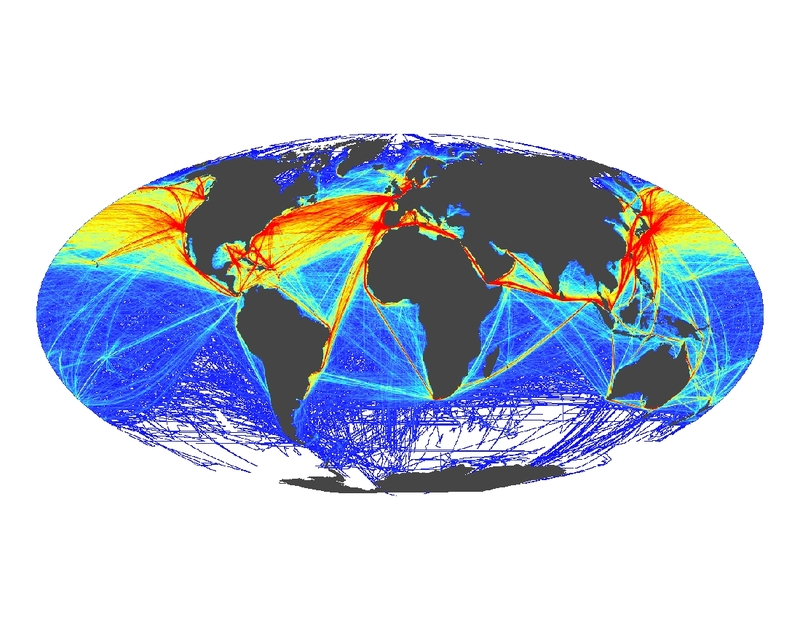 The plastic continents in the ocean are without nationality, without definable borders and they spin like nebula in every major ocean in the world. They exist in a suspended state outside of the social contracts of nation states. 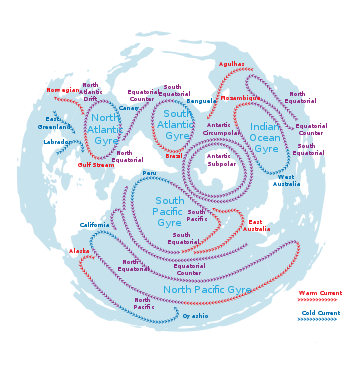 The great ocean gyres stem from the global economy of waste and excess, and operate within the chaos of natural laws in a state of suspended animation. This project seeks to explore the geopolitical implications of this new eco-trash-vortex and the origins of the contemporary systemic condition that creates it. Petroleum, the originary source of this system, is inextricably linked to our existence in the age of Empire. By exploring society’s inseparable relationship to petroleum and its petrochemical offspring we hope to unpack the material bond between humans and oil. There a “covalent” bond between the humans and petroleum. Humankind is both attracted to and repulsed by oil. Oil is the global enabler for transnational migration, the container for trade, and also the source of global war and pollution. The concept of a chemical bond suggests that our relationship with oil is not guided by technological advancement but rather by material attraction. This idea is supported by Manuel De Landa who looks at humans as an organic host for such material relationships. He writes, “Our organic bodies are, in this sense, nothing but temporary coagulation of these flows; we capture in our bodies a certain portion of the flow at birth, then release it again when we die and microorganisms transform us into a new batch of raw materials.” Through this paradigm human’s can be seen as a host for oil. We have in some sense fallen in love with our captor, oil. In Herzog’s Lessons in Darkness, taking place after the first war in the Gulf, he shows a landscape dominated by oil. Oil leaking, oil flowing, oil burning. When all the fires are out, the workers not knowing what else to do, set new fires. The narrator then says, “has life without fire become unbearable for them?” Thus demonstrating the workers are addicted to the fires, the turbulence from oil comforts them. They need a fire to fight so they can define themselves as controlling that fire. On a macro scale this articulates the human addiction to oil. Oil becomes the protagonist to human existence. “A post-apocalyptic entity composed of organic corpses flattened, piled up and liquidated in sedimentary basins (mega-graveyards).” It is a living/dying biomass, compressed through geologic time and condensed into a flammable liquids and gases of hydrocarbons and volatile organic compounds. Unable to migrate any further on its own, oil is trapped in cap rocks in the earth’s crust, under pressure while waiting for a host. Oil is known to be used as far back as 4000 years ago in the upper levels of Babylonian society. It is named “petroleum” in the 16th century by a German mineralogist. The British patent, “A way to extract and make great quantities of pitch, tar, and oyle out of a sort of stone” in the 17th century. Oil experiences its meteoric rise only with the development of the automobile and air travel in the 20th century. The bulk of crude deposits are converted into “primary source” fuel oil and gasoline. The remaining fraction of oil is made into pharmaceuticals, solvents, fertilizers, pesticides, and plastics. All of these derivatives are a way of controlling the organic entity we know as petroleum. Solid-state: Oil, in situ, is mostly liquid with the exception of some types of deposits found largely in the Americas. It is drilled, pumped, piped and shipped within a vast conspiratorial network of moneyed interests across borders, suggesting transgressive heart lines of new nation-states. The crude liquid begins the final leg of its millennial journey toward multiple ends. In the cycle of degradation most crude oil moves in the direction of fuel production, combustion and airborne particulate waste. The smaller percentage of crude phase-changes into solid materials. The stranded molecular chains of polymers are cast, pressed, molded and extruded to create the plastic bags, take-out containers, children’s toys, automobile tires, mobile phones, electronics and packaging for human needs. Plastic is a temporary, useful and trusted material. It is known for cleanness, sterility, strength, longevity and flexibility. Every plastic item ever manufactured is still with us today in some form though, largely in the waste pits of our cities and waters of our oceans, barring destruction by fire which is known to release toxins such as dioxin. Since the 1950s, one billion tons of plastic have been discarded and may persist for hundreds or even thousands of years. Thus, aged oil ironically finds longevity after the degradation of its powerful potential energies when converted into solid plastics. Over time plastic items are cast off and they migrate in the vectors and currents of the waste cycle, both inside and outside formal systems of control. Some are turned back inward and reformed anew as textiles, sub-urban lawn furniture and building materials. However, due to the difficulty of sorting the large quantity of different plastics into recyclable bulk, much of the plastic waste enters end-of-life scenarios of landfills and trash incinerators. Technologies such as Active Disassembly (AD) utilize pressure and temperature thresholds to dismantle plastic components for recycling, however, this technology is not in wide use. Somehow, in order to maintain balance in society we must overproduce and cast-off. 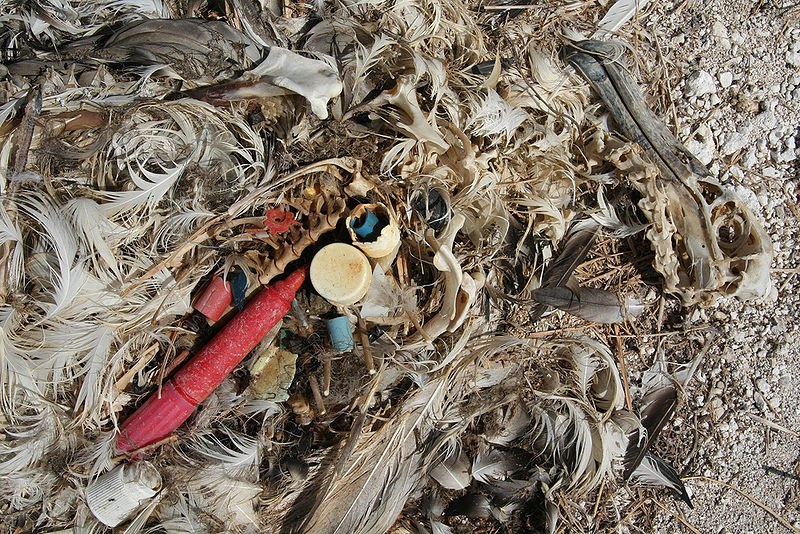 An albatross, having ingested some plastic. It is amazing and frightening to imagine the amount of waste produced by oil and it’s derivatives. Though the effects become more apparent with the onset of global warming, and the visibility of the gyre that holds no single nation accountable. Like a true addict society begins to recognize there is a problem, but cannot kick the petroleum habit. The problem is the aforementioned bond. Petroleum has so invaded our lives that we can’t envision a world without it, and perhaps we don’t have too. The great paradox of oil is that while we talk about the damage it is causing to our environment, we simultaneously fight to maintain our conduit to it. Society ultimately fears the loss of access to oil more than the damage caused by its pervasive use. Our current geopolitical system relies on the scarcity of oil. It perpetuates and enables wars, it defines developed and “under”developed nations. It sets up a series of political and economic relationships that bind and repel nation-states. We need oil not simply for its material uses but because it forms global power relations. It is the new cold war. The question then becomes what if we put out the fire? What if oil isn’t scare? If the ice caps melt, and the US and Canada suddenly possess the largest deposit of oil known to man or if we discover that oil is a renewable resource. The ground disappears both figuratively and literally. Negarastani asks “without a ground, that is to say, in the absence of a power formation, the definition of ‘power’ is basically undermined. What is politics, then, when there is power but no power formation?” Perhaps this is the post-empire we’ve been seeking. The question then becomes when the bond between human and oil reaches its solid state will we literally be stuck or will we find a new accelerant? A Thousand Years of Nonlinear History, 104.